Weekends in the summer are a time to relax with friends and family and celebrate the gorgeous weather, but it also means you’re more than likely going to attend or throw a party of some sort. 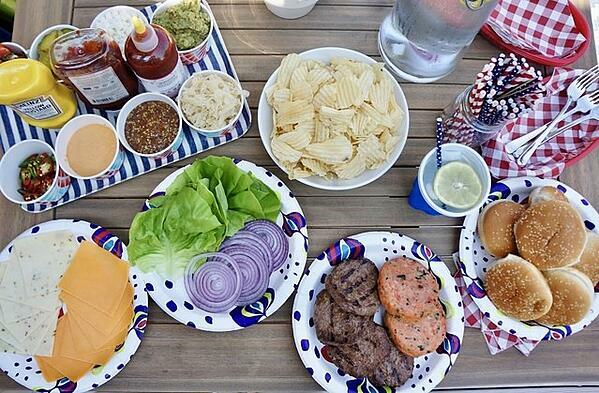 Most of my summer parties include American classics – corn on the cob, hot dogs, burgers, and ice cream! Take your party up a notch with a gourmet burger bar! Take the stress out of planning a yummy get together by following this guide for hosting an unforgettable summer party complete with this gourmet burger bar! To take a little work off your plate, have your guests pitch in! It’s a fun way to get everyone involved and ensure everyone can have their burger just the way they like. This is all about presentation! First things first: the serving ware! 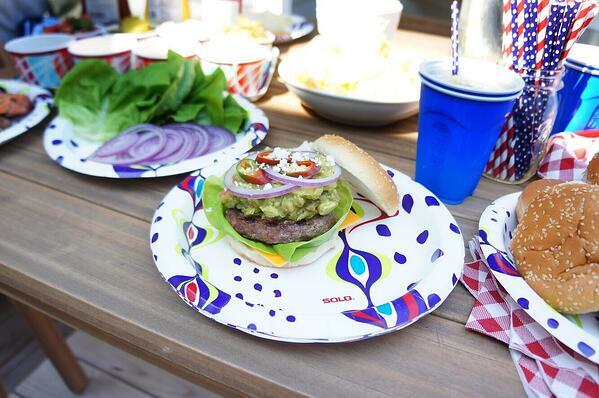 In this case, Solo’s fantastic new paper plates. I am loving the pattern on these! So festive and perfect for summer! I used the large plates to put out all the ingredients for this mouth watering burger bar. In Solo’s smaller bowls to go, I laid out all of the possible condiments and toppings you could think of. Now what we’ve all been waiting for: the FOOD! The main component of the burger bar: the burgers! 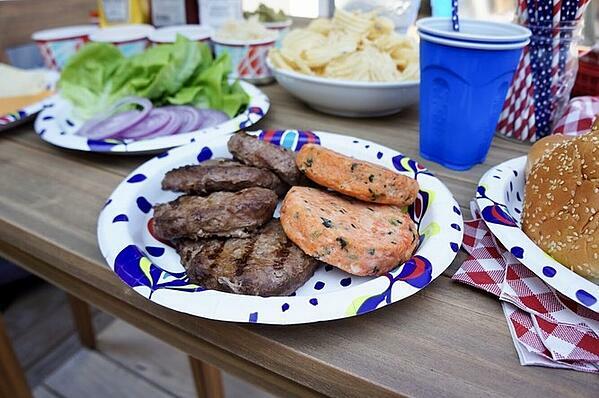 For variety in choices for your guests, try grilling beef and salmon patties, and even include grilled chicken breasts or portabello mushrooms for those veggie lovers! For those who love cheeseburgers, set up a Solo plate with with cheddar, american, pepper jack, provolone, and any other type of cheeses you’d like! 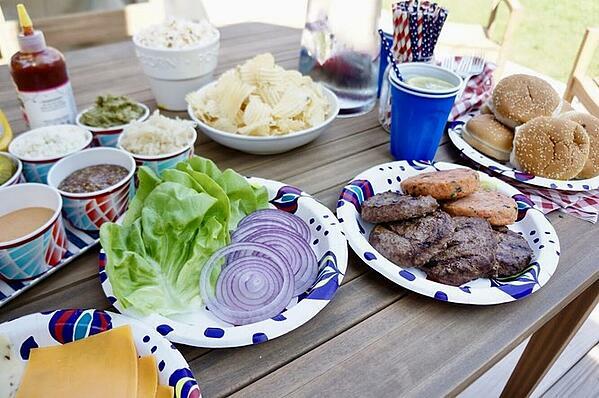 Make another plate with lettuce, tomato and raw onions. One last plate with buns of your choice. I picked a classic sesame bun, but pretzel buns are fun, too! 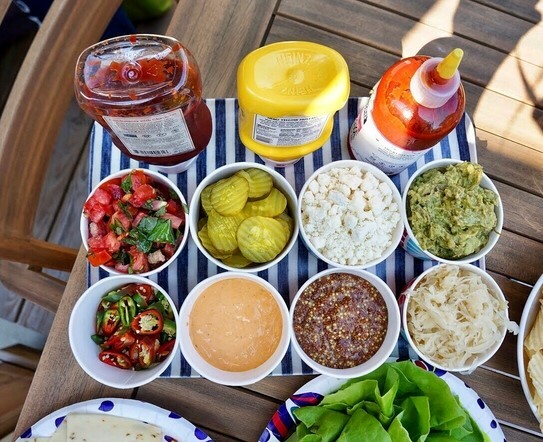 Go nuts with sauces in smaller bowls to go, – ketchup, mustard, sriracha, spicy mustard, sauerkraut, guacamole, pickles, special sauce, blue cheese crumbles, jalapeños for those who like some heat, and bruschetta tomatoes! The more the merrier! Pour these in the smaller bowls with spoons for serving ease. For a burger that will REALLY impress your guests, I’m giving you my famous southwestern turkey burger. This has some heat, so get your frosty beverage ready in your Solo Plastic Party cup! If you loved this post, be sure to check out how to host an epic s’mores party! In a large bowl, combine the ground turkey, jalapeno, cumin, garlic, parmesan cheese, and chili powder. Mix gently with your hands—but do not over mix. Form the ground turkey mixture into 6-ounce burger patties (roughly ¾-inch thick). 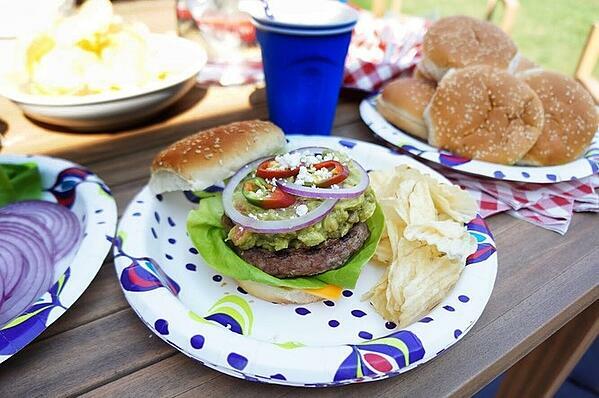 Heat your grill and grease the burgers lightly with cooking spray. Cook the burgers on each side until charred, roughly 4-5 minutes per side (or until the internal temperature reaches roughly 165 degrees Fahrenheit). Top each burger with 1 ounce of pepper jack cheese, close grill top and cook until the cheese has just melted. Remove and allow the burgers for rest for several minutes. Meanwhile, grill or toast buns lightly, if desired. Top with guacamole, more jalapenos, and other toppings.